Very few children who have an autism spectrum disorder (ASD) diagnosis meet the criteria for childhood disintegrative disorder (CDD). An estimate based on four surveys of ASD found fewer than two children per 100,000 with ASD could be classified as having CDD. This suggests that CDD is a very rare form of ASD. It has a strong male preponderance. ** Symptoms may appear by age 2, but the average age of onset is between 3 and 4 years. Until this time, the child has age-appropriate skills in communication and social relationships. The long period of normal development before regression helps differentiate CDD from Rett syndrome. The loss of such skills as vocabulary are more dramatic in CDD than they are in classical autism. The diagnosis requires extensive and pronounced losses involving motor, language, and social skills. *** CDD is also accompanied by loss of bowel and bladder control and oftentimes seizures and a very low IQ. **Frombonne E. Prevalence of childhood disintegrative disorder. Autism, 2002; 6(2): 149-157. ***Volkmar RM and Rutter M. Childhood disintegrative disorder: Results of the DSM-IV autism field trial. Journal of the American Academy of Child and Adolescent Psychiatry, 1995; 34: 1092-1095. The autism spectrum disorders are more common in the pediatric population than are some better known disorders such as diabetes, spinal bifida, or Down syndrome.2 Prevalence studies have been done in several states and also in the United Kingdom, Europe, and Asia. Prevalence estimates range from 2 to 6 per 1,000 children. This wide range of prevalence points to a need for earlier and more accurate screening for the symptoms of ASD. The earlier the disorder is diagnosed, the sooner the child can be helped through treatment interventions. Pediatricians, family physicians, daycare providers, professionals, and parents may initially dismiss signs of ASD, optimistically thinking the child is just a little slow and will "catch up." Although early intervention has a dramatic impact on reducing symptoms and increasing a child's ability to grow and learn new skills, it is estimated that only 50 percent of children are diagnosed before kindergarten. All children with ASD demonstrate deficits in 1) social interaction, 2) verbal and nonverbal communication, and 3) repetitive behaviors or interests. In addition, they will often have unusual responses to sensory experiences, such as certain sounds or the way objects look. Each of these symptoms runs the gamut from mild to severe. They will present in each individual child differently. For instance, a child may have little trouble learning to read but exhibit extremely poor social interaction. Each child will display communication, social, and behavioral patterns that are individual but fit into the overall diagnosis of ASD. Children with ASD do not follow the typical patterns of child development. In some children, hints of future problems may be apparent from birth. In most cases, the problems in communication and social skills become more noticeable as the child lags further behind other children the same age. Some other children start off well enough. Oftentimes between 12 and 36 months old, the differences in the way they react to people and other unusual behaviors become apparent. Some parents report the change as being sudden, and that their children start to reject people, act strangely, and lose language and social skills they had previously acquired. In other cases, there is a plateau, or leveling, of progress so that the difference between the child with autism and other children the same age becomes more noticeable. In contrast, most children with ASD seem to have tremendous difficulty learning to engage in the give-and-take of everyday human interaction. Even in the first few months of life, many do not interact and they avoid eye contact. They seem indifferent to other people, and often seem to prefer being alone. They may resist attention or passively accept hugs and cuddling. Later, they seldom seek comfort or respond to parents' displays of anger or affection in a typical way. Research has suggested that although children with ASD are attached to their parents, their expression of this attachment is unusual and difficult to "read." To parents, it may seem as if their child is not attached at all. Parents who looked forward to the joys of cuddling, teaching, and playing with their child may feel crushed by this lack of the expected and typical attachment behavior. Children with ASD also are slower in learning to interpret what others are thinking and feeling. Subtle social cues—whether a smile, a wink, or a grimace—may have little meaning. To a child who misses these cues, "Come here" always means the same thing, whether the speaker is smiling and extending her arms for a hug or frowning and planting her fists on her hips. Without the ability to interpret gestures and facial expressions, the social world may seem bewildering. To compound the problem, people with ASD have difficulty seeing things from another person's perspective. Most 5-year-olds understand that other people have different information, feelings, and goals than they have. A person with ASD may lack such understanding. This inability leaves them unable to predict or understand other people's actions. Although not universal, it is common for people with ASD also to have difficulty regulating their emotions. This can take the form of "immature" behavior such as crying in class or verbal outbursts that seem inappropriate to those around them. The individual with ASD might also be disruptive and physically aggressive at times, making social relationships still more difficult. They have a tendency to "lose control," particularly when they're in a strange or overwhelming environment, or when angry and frustrated. They may at times break things, attack others, or hurt themselves. In their frustration, some bang their heads, pull their hair, or bite their arms. By age 3, most children have passed predictable milestones on the path to learning language; one of the earliest is babbling. By the first birthday, a typical toddler says words, turns when he hears his name, points when he wants a toy, and when offered something distasteful, makes it clear that the answer is "no." Some children diagnosed with ASD remain mute throughout their lives. Some infants who later show signs of ASD coo and babble during the first few months of life, but they soon stop. Others may be delayed, developing language as late as age 5 to 9. Some children may learn to use communication systems such as pictures or sign language. Those who do speak often use language in unusual ways. They seem unable to combine words into meaningful sentences. Some speak only single words, while others repeat the same phrase over and over. Some ASD children parrot what they hear, a condition called echolalia. Although many children with no ASD go through a stage where they repeat what they hear, it normally passes by the time they are 3. Some children only mildly affected may exhibit slight delays in language, or even seem to have precocious language and unusually large vocabularies, but have great difficulty in sustaining a conversation. The "give and take" of normal conversation is hard for them, although they often carry on a monologue on a favorite subject, giving no one else an opportunity to comment. Another difficulty is often the inability to understand body language, tone of voice, or "phrases of speech." They might interpret a sarcastic expression such as "Oh, that's just great" as meaning it really IS great. While it can be hard to understand what ASD children are saying, their body language is also difficult to understand. Facial expressions, movements, and gestures rarely match what they are saying. Also, their tone of voice fails to reflect their feelings. A high-pitched, sing-song, or flat, robot-like voice is common. Some children with relatively good language skills speak like little adults, failing to pick up on the "kid-speak" that is common in their peers. Without meaningful gestures or the language to ask for things, people with ASD are at a loss to let others know what they need. As a result, they may simply scream or grab what they want. Until they are taught better ways to express their needs, ASD children do whatever they can to get through to others. As people with ASD grow up, they can become increasingly aware of their difficulties in understanding others and in being understood. As a result they may become anxious or depressed. Although children with ASD usually appear physically normal and have good muscle control, odd repetitive motions may set them off from other children. These behaviors might be extreme and highly apparent or more subtle. Some children and older individuals spend a lot of time repeatedly flapping their arms or walking on their toes. Some suddenly freeze in position. As children, they might spend hours lining up their cars and trains in a certain way, rather than using them for pretend play. If someone accidentally moves one of the toys, the child may be tremendously upset. ASD children need, and demand, absolute consistency in their environment. A slight change in any routine—in mealtimes, dressing, taking a bath, going to school at a certain time and by the same route—can be extremely disturbing. Perhaps order and sameness lend some stability in a world of confusion. Repetitive behavior sometimes takes the form of a persistent, intense preoccupation. For example, the child might be obsessed with learning all about vacuum cleaners, train schedules, or lighthouses. Often there is great interest in numbers, symbols, or science topics. Sensory problems. When children's perceptions are accurate, they can learn from what they see, feel, or hear. On the other hand, if sensory information is faulty, the child's experiences of the world can be confusing. Many ASD children are highly attuned or even painfully sensitive to certain sounds, textures, tastes, and smells. Some children find the feel of clothes touching their skin almost unbearable. Some sounds—a vacuum cleaner, a ringing telephone, a sudden storm, even the sound of waves lapping the shoreline—will cause these children to cover their ears and scream. In ASD, the brain seems unable to balance the senses appropriately. Some ASD children are oblivious to extreme cold or pain. An ASD child may fall and break an arm, yet never cry. Another may bash his head against a wall and not wince, but a light touch may make the child scream with alarm. Intellectual Disability. Many children with ASD have some degree of mental impairment. When tested, some areas of ability may be normal, while others may be especially weak. For example, a child with ASD may do well on the parts of the test that measure visual skills but earn low scores on the language subtests. Seizures. One in four children with ASD develops seizures, often starting either in early childhood or adolescence.4 Seizures, caused by abnormal electrical activity in the brain, can produce a temporary loss of consciousness (a "blackout"), a body convulsion, unusual movements, or staring spells. Sometimes a contributing factor is a lack of sleep or a high fever. An EEG (electroencephalogram—recording of the electric currents developed in the brain by means of electrodes applied to the scalp) can help confirm the seizure's presence. In most cases, seizures can be controlled by a number of medicines called "anticonvulsants." The dosage of the medication is adjusted carefully so that the least possible amount of medication will be used to be effective. Fragile X syndrome. This disorder is the most common inherited form of mental retardation. It was so named because one part of the X chromosome has a defective piece that appears pinched and fragile when under a microscope. Fragile X syndrome affects about two to five percent of people with ASD. It is important to have a child with ASD checked for Fragile X, especially if the parents are considering having another child. For an unknown reason, if a child with ASD also has Fragile X, there is a one-in-two chance that boys born to the same parents will have the syndrome.5 Other members of the family who may be contemplating having a child may also wish to be checked for the syndrome. A "well child" check-up should include a developmental screening test. If your child's pediatrician does not routinely check your child with such a test, ask that it be done. Your own observations and concerns about your child's development will be essential in helping to screen your child.7 Reviewing family videotapes, photos, and baby albums can help parents remember when each behavior was first noticed and when the child reached certain developmental milestones. Several screening instruments have been developed to quickly gather information about a child's social and communicative development within medical settings. Among them are the Checklist of Autism in Toddlers (CHAT),8 the modified Checklist for Autism in Toddlers (M-CHAT),9 the Screening Tool for Autism in Two-Year-Olds (STAT),10 and the Social Communication Questionnaire (SCQ)11 (for children 4 years of age and older). Some screening instruments rely solely on parent responses to a questionnaire, and some rely on a combination of parent report and observation. Key items on these instruments that appear to differentiate children with autism from other groups before the age of 2 include pointing and pretend play. Screening instruments do not provide individual diagnosis but serve to assess the need for referral for possible diagnosis of ASD. These screening methods may not identify children with mild ASD, such as those with high-functioning autism or Asperger syndrome. During the last few years, screening instruments have been devised to screen for Asperger syndrome and higher functioning autism. The Autism Spectrum Screening Questionnaire (ASSQ),12 the Australian Scale for Asperger's Syndrome,13 and the most recent, the Childhood Asperger Syndrome Test (CAST),14 are some of the instruments that are reliable for identification of school-age children with Asperger syndrome or higher functioning autism. These tools concentrate on social and behavioral impairments in children without significant language delay. If, following the screening process or during a routine "well child" check-up, your child's doctor sees any of the possible indicators of ASD, further evaluation is indicated. When your child has been evaluated and diagnosed with an autism spectrum disorder, you may feel inadequate to help your child develop to the fullest extent of his or her ability. As you begin to look at treatment options and at the types of aid available for a child with a disability, you will find out that there is help for you. It is going to be difficult to learn and remember everything you need to know about the resources that will be most helpful. Write down everything. If you keep a notebook, you will have a foolproof method of recalling information. Keep a record of the doctors' reports and the evaluation your child has been given so that his or her eligibility for special programs will be documented. Learn everything you can about special programs for your child; the more you know, the more effectively you can advocate. For every child eligible for special programs, each state guarantees special education and related services. The Individuals with Disabilities Education Act (IDEA) is a Federally mandated program that assures a free and appropriate public education for children with diagnosed learning deficits. Usually children are placed in public schools and the school district pays for all necessary services. These will include, as needed, services by a speech therapist, occupational therapist, school psychologist, social worker, school nurse, or aide. By law, the public schools must prepare and carry out a set of instruction goals, or specific skills, for every child in a special education program. The list of skills is known as the child's Individualized Education Program (IEP). The IEP is an agreement between the school and the family on the child's goals. When your child's IEP is developed, you will be asked to attend the meeting. There will be several people at this meeting, including a special education professional, a representative of the public schools who is knowledgeable about the program, other individuals invited by the school or by you (you may want to bring a relative, a child care provider, or a supportive close friend who knows your child well). Parents play an important part in creating the program, as they know their child and his or her needs best. Once your child's IEP is developed, a meeting is scheduled once a year to review your child's progress and to make any alterations to reflect his or her changing needs. If your child is under 3 years of age and has special needs, he or she should be eligible for an early intervention program; this program is available in every state. Each state decides which agency will be the lead agency in the early intervention program. The early intervention services are provided by workers qualified to care for toddlers with disabilities and are usually in the child's home or a place familiar to the child. The services provided are written into an Individualized Family Service Plan (IFSP) that is reviewed at least once every 6 months. The plan will describe services that will be provided to the child, but will also describe services for parents to help them in daily activities with their child and for siblings to help them adjust to having a brother or sister with ASD. There is a list of resources at the back of the brochure that will be helpful to you as you look for programs for your child. Among the many methods available for treatment and education of people with autism, applied behavior analysis (ABA) has become widely accepted as an effective treatment. Mental Health: A Report of the Surgeon General states, "Thirty years of research demonstrated the efficacy of applied behavioral methods in reducing inappropriate behavior and in increasing communication, learning, and appropriate social behavior. "18 The basic research done by Ivar Lovaas and his colleagues at the University of California, Los Angeles, calling for an intensive, one-on-one child-professional interaction for 40 hours a week, laid a foundation for other educators and researchers in the search for further effective early interventions to help those with ASD attain their potential. The goal of behavioral management is to reinforce desirable behaviors and reduce undesirable ones.19, 20 An effective treatment program will build on the child's interests, offer a predictable schedule, teach tasks as a series of simple steps, actively engage the child's attention in highly structured activities, and provide regular reinforcement of behavior. Parental involvement has emerged as a major factor in treatment success. Parents work with professionals and therapists to identify the behaviors to be changed and the skills to be taught. Recognizing that parents are the child's earliest professionals, more programs are beginning to train parents to continue the therapy at home. As soon as a child's disability has been identified, instruction should begin. Effective programs will teach early communication and social interaction skills. In children younger than 3 years, appropriate interventions usually take place in the home or a child care center. These interventions target specific deficits in learning, language, imitation, attention, motivation, compliance, and initiative of interaction. Included are behavioral methods, communication, occupational and physical therapy along with social play interventions. Often the day will begin with a physical activity to help develop coordination and body awareness; children string beads, piece puzzles together, paint, and participate in other motor skills activities. At snack time the professional encourages social interaction and models how to use language to ask for more juice. The children learn by doing. Working with the children are students, behavioral therapists, and parents who have received extensive training. In teaching the children, positive reinforcement is used.21 Children older than 3 years usually have school-based, individualized, special education. The child may be in a segregated class with other autistic children or in an integrated class with children without disabilities for at least part of the day. Different localities may use differing methods but all should provide a structure that will help the children learn social skills and functional communication. In these programs, professionals often involve the parents, giving useful advice in how to help their child use the skills or behaviors learned at school when they are at home.22 In elementary school, the child should receive help in any skill area that is delayed and, at the same time, be encouraged to grow in his or her areas of strength. Ideally, the curriculum should be adapted to the individual child's needs. Many schools today have an inclusion program in which the child is in a regular classroom for most of the day, with special instruction for a part of the day. This instruction should include such skills as learning how to act in social situations and in making friends. Although higher-functioning children may be able to handle academic work, they too need help to organize tasks and avoid distractions. During middle and high school years, instruction will begin to address such practical matters as work, community living, and recreational activities. This should include work experience, using public transportation, and learning skills that will be important in community living.23 All through your child's school years, you will want to be an active participant in his or her education program. Collaboration between parents and educators is essential in evaluating your child's progress. Adolescence is a time of stress and confusion; and it is no less so for teenagers with autism. Like all children, they need help in dealing with their budding sexuality. While some behaviors improve during the teenage years, some get worse. Increased autistic or aggressive behavior may be one way some teens express their newfound tension and confusion. The teenage years are also a time when children become more socially sensitive. At the age that most teenagers are concerned with acne, popularity, grades, and dates, teens with autism may become painfully aware that they are different from their peers. They may notice that they lack friends. And unlike their schoolmates, they aren't dating or planning for a career. For some, the sadness that comes with such realization motivates them to learn new behaviors and acquire better social skills. In an effort to do everything possible to help their children, many parents continually seek new treatments. Some treatments are developed by reputable therapists or by parents of a child with ASD. Although an unproven treatment may help one child, it may not prove beneficial to another. To be accepted as a proven treatment, the treatment should undergo clinical trials, preferably randomized, double-blind trials, that would allow for a comparison between treatment and no treatment. Following are some of the interventions that have been reported to have been helpful to some children but whose efficacy or safety has not been proven. Dietary interventions are based on the idea that 1) food allergies cause symptoms of autism, and 2) an insufficiency of a specific vitamin or mineral may cause some autistic symptoms. If parents decide to try for a given period of time a special diet, they should be sure that the child's nutritional status is measured carefully. A diet that some parents have found was helpful to their autistic child is a gluten-free, casein-free diet. Gluten is a casein-like substance that is found in the seeds of various cereal plants—wheat, oat, rye, and barley. Casein is the principal protein in milk. Since gluten and milk are found in many of the foods we eat, following a gluten-free, casein-free diet is difficult. Medications are often used to treat behavioral problems, such as aggression, self-injurious behavior, and severe tantrums, that keep the person with ASD from functioning more effectively at home or school. The medications used are those that have been developed to treat similar symptoms in other disorders. Many of these medications are prescribed "off-label." This means they have not been officially approved by the FDA for use in children, but the doctor prescribes the medications if he or she feels they are appropriate for your child. Further research needs to be done to ensure not only the efficacy but the safety of psychotropic agents used in the treatment of children and adolescents. A child with ASD may not respond in the same way to medications as typically developing children. It is important that parents work with a doctor who has experience with children with autism. A child should be monitored closely while taking a medication. The doctor will prescribe the lowest dose possible to be effective. Ask the doctor about any side effects the medication may have and keep a record of how your child responds to the medication. It will be helpful to read the "patient insert" that comes with your child's medication. Some people keep the patient inserts in a small notebook to be used as a reference. This is most useful when several medications are prescribed. Anxiety and depression. The selective serotonin reuptake inhibitors (SSRI's) are the medications most often prescribed for symptoms of anxiety, depression, and/or obsessive-compulsive disorder (OCD). Only one of the SSRI's, fluoxetine, (Prozac®) has been approved by the FDA for both OCD and depression in children age 7 and older. Three that have been approved for OCD are fluvoxamine (Luvox®), age 8 and older; sertraline (Zoloft®), age 6 and older; and clomipramine (Anafranil®), age 10 and older.4 Treatment with these medications can be associated with decreased frequency of repetitive, ritualistic behavior and improvements in eye contact and social contacts. The FDA is studying and analyzing data to better understand how to use the SSRI's safely, effectively, and at the lowest dose possible. Behavioral problems. Antipsychotic medications have been used to treat severe behavioral problems. These medications work by reducing the activity in the brain of the neurotransmitter dopamine. Among the older, typical antipsychotics, such as haloperidol (Haldol®), thioridazine, fluphenazine, and chlorpromazine, haloperidol was found in more than one study to be more effective than a placebo in treating serious behavioral problems.25 However, haloperidol, while helpful for reducing symptoms of aggression, can also have adverse side effects, such as sedation, muscle stiffness, and abnormal movements. Placebo-controlled studies of the newer "atypical" antipsychotics are being conducted on children with autism. The first such study, conducted by the NIMH-supported Research Units on Pediatric Psychopharmacology (RUPP) Autism Network, was on risperidone (Risperdal®).26 Results of the 8-week study were reported in 2002 and showed that risperidone was effective and well tolerated for the treatment of severe behavioral problems in children with autism. The most common side effects were increased appetite, weight gain and sedation. Further long-term studies are needed to determine any long-term side effects. Other atypical antipsychotics that have been studied recently with encouraging results are olanzapine (Zyprexa®) and ziprasidone (Geodon®). Ziprasidone has not been associated with significant weight gain. Seizures. Seizures are found in one in four persons with ASD, most often in those who have low IQ or are mute. They are treated with one or more of the anticonvulsants. These include such medications as carbamazepine (Tegretol®), lamotrigine (Lamictal®), topiramate (Topamax®), and valproic acid (Depakote®). The level of the medication in the blood should be monitored carefully and adjusted so that the least amount possible is used to be effective. Although medication usually reduces the number of seizures, it cannot always eliminate them. Inattention and hyperactivity. Stimulant medications such as methylphenidate (Ritalin®), used safely and effectively in persons with attention deficit hyperactivity disorder, have also been prescribed for children with autism. These medications may decrease impulsivity and hyperactivity in some children, especially those higher functioning children. Several other medications have been used to treat ASD symptoms; among them are other antidepressants, naltrexone, lithium, and some of the benzodiazepines such as diazepam (Valium®) and lorazepam (Ativan®). The safety and efficacy of these medications in children with autism has not been proven. Since people may respond differently to different medications, your child's unique history and behavior will help your doctor decide which medication might be most beneficial. Some adults with ASD, especially those with high-functioning autism or with Asperger syndrome, are able to work successfully in mainstream jobs. Nevertheless, communication and social problems often cause difficulties in many areas of life. They will continue to need encouragement and moral support in their struggle for an independent life. The public schools' responsibility for providing services ends when the person with ASD reaches the age of 22. The family is then faced with the challenge of finding living arrangements and employment to match the particular needs of their adult child, as well as the programs and facilities that can provide support services to achieve these goals. Long before your child finishes school, you will want to search for the best programs and facilities for your young adult. If you know other parents of ASD adults, ask them about the services available in your community. If your community has little to offer, serve as an advocate for your child and work toward the goal of improved employment services. Research the resources listed in the back of this brochure to learn as much as possible about the help your child is eligible to receive as an adult. Independent living. Some adults with ASD are able to live entirely on their own. Others can live semi-independently in their own home or apartment if they have assistance with solving major problems, such as personal finances or dealing with the government agencies that provide services to persons with disabilities. This assistance can be provided by family, a professional agency, or another type of provider. Living at home. Government funds are available for families that choose to have their adult child with ASD live at home. These programs include Supplemental Security Income (SSI), Social Security Disability Insurance (SSDI), Medicaid waivers, and others. Information about these programs is available from the Social Security Administration (SSA). An appointment with a local SSA office is a good first step to take in understanding the programs for which the young adult is eligible. Foster homes and skill-development homes. Some families open their homes to provide long-term care to unrelated adults with disabilities. If the home teaches self-care and housekeeping skills and arranges leisure activities, it is called a "skill-development" home. Supervised group living. Persons with disabilities frequently live in group homes or apartments staffed by professionals who help the individuals with basic needs. These often include meal preparation, housekeeping, and personal care needs. Higher functioning persons may be able to live in a home or apartment where staff only visit a few times a week. These persons generally prepare their own meals, go to work, and conduct other daily activities on their own. Institutions. Although the trend in recent decades has been to avoid placing persons with disabilities into long-term-care institutions, this alternative is still available for persons with ASD who need intensive, constant supervision. Unlike many of the institutions years ago, today's facilities view residents as individuals with human needs and offer opportunities for recreation and simple but meaningful work. Research into the causes, the diagnosis, and the treatment of autism spectrum disorders has advanced in tandem. With new well-researched standardized diagnostic tools, ASD can be diagnosed at an early age. And with early diagnosis, the treatments found to be beneficial in recent years can be used to help the child with ASD develop to his or her greatest potential. In the past few years, there has been public interest in a theory that suggested a link between the use of thimerosal, a mercury-based preservative used in the measles-mumps-rubella (MMR) vaccine, and autism. Although mercury is no longer found in childhood vaccines in the United States, some parents still have concerns about vaccinations. Many well-done, large-scale studies have now been done that have failed to show a link between thimerosal and autism. A panel from the Institute of Medicine is now examining these studies, including a large Danish study that concluded that there was no causal relationship between childhood vaccination using thimerosal-containing vaccines and the development of an autism spectrum disorder,27 and a U.S. study looking at exposure to mercury, lead, and other heavy metals. 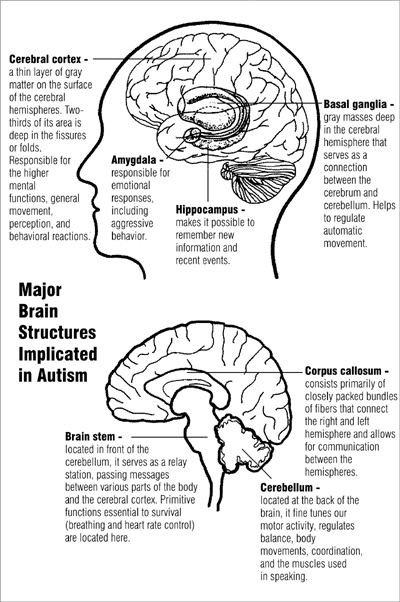 Postmortem and MRI studies have shown that many major brain structures are implicated in autism. This includes the cerebellum, cerebral cortex, limbic system, corpus callosum, basal ganglia, and brain stem.28 Other research is focusing on the role of neurotransmitters such as serotonin, dopamine, and epinephrine. Research into the causes of autism spectrum disorders is being fueled by other recent developments. Evidence points to genetic factors playing a prominent role in the causes for ASD. Twin and family studies have suggested an underlying genetic vulnerability to ASD.29 To further research in this field, the Autism Genetic Resource Exchange, a project initiated by the Cure Autism Now Foundation, and aided by an NIMH grant, is recruiting genetic samples from several hundred families. Each family with more than one member diagnosed with ASD is given a 2-hour, in-home screening. With a large number of DNA samples, it is hoped that the most important genes will be found. This will enable scientists to learn what the culprit genes do and how they can go wrong. Recent neuroimaging studies have shown that a contributing cause for autism may be abnormal brain development beginning in the infant's first months. This "growth dysregulation hypothesis" holds that the anatomical abnormalities seen in autism are caused by genetic defects in brain growth factors. It is possible that sudden, rapid head growth in an infant may be an early warning signal that will lead to early diagnosis and effective biological intervention or possible prevention of autism.30 For detailed information on autism spectrum disorders research, see NIMH research fact sheet, Autism Spectrum Disorders Research. The Children's Health Act of 2000 was responsible for the creation of the Interagency Autism Coordinating Committee (IACC), a committee that includes the directors of five NIH institutes—the National Institute of Mental Health, the National Institute of Neurological Disorders and Stroke, the National Institute on Deafness and Other Communication Disorders (NIDCD), the National Institute of Child Health and Human Development (NICHD), and the National Institute of Environmental Health Sciences (NIEHS)—as well as representatives from the Health Resource Services Administration, the National Center on Birth Defects and Developmental Disabilities (a part of the Centers for Disease Control), the Agency for Toxic Substances and Disease Registry, the Substance Abuse and Mental Health Services Administration, the Administration on Developmental Disabilities, the Centers for Medicare and Medicaid Services, the U.S. Food and Drug Administration, and the U.S. Department of Education. The Committee, instructed by the Congress to develop a 10-year agenda for autism research, introduced the plan, dubbed a "matrix" or a "roadmap," at the first Autism Summit Conference in November 2003. The roadmap indicates priorities for research for years 1 to 3, years 4 to 6, and years 7 to 10. 1 American Psychiatric Association. Diagnostic and statistical manual of mental disorders: DSM-IV-TR (fourth edition, text revision). Washington DC: American Psychiatric Association, 2000. 2 Filipek PA, Accardo PJ, Baranek GT, Cook Jr. EH, Dawson G, Gordon B, Gravel JS, Johnson CP, Kellen RJ, Levy SE, Minshew NJ, Prizant BM, Rapin I, Rogers SJ, Stone WL, Teplin S, Tuchman RF, Volkmar FR. The screening and diagnosis of autism spectrum disorders. Journal of Autism and Developmental Disorders, 1999; 29(2): 439-484. 3 Newschaffer CJ (Johns Hopkins Bloomberg School of Public Health). Autism Among Us: Rising Concerns and the Public Health Response [Video on the Internet]. Public Health Training Network, 2003 June 20. Available from: http://www.publichealthgrandrounds.unc.edu/autism/webcast.htm. 4 Volkmar FR. Medical Problems, Treatments, and Professionals. In: Powers MD, ed. Children with Autism: A Parent's Guide, Second Edition. Bethesda, MD: Woodbine House, 2000; 73-74. 5 Powers MD. What Is Autism? In: Powers MD, ed. Children with Autism: A Parent's Guide, Second Edition. Bethesda, MD: Woodbine House, 2000, 28. 6 Smalley SI, Autism and tuberous sclerosis. Journal of Autism and Developmental Disorders, 1998; 28(5): 407-414. 7 Filipek PA, Accardo PJ, Ashwal S, Baranek GT, Cook Jr. EH, Dawson G, Gordon B, Gravel JS, Johnson CP, Kallen RJ, Levy SE, Minshew NJ, Ozonoff S, Prizant BM, Rapin I, Rogers SJ, Stone WL, Teplin SW, Tuchman RF, Volkmar FR. Practice parameter: screening and diagnosis of autism. Neurology, 2000; 55: 468-479. 8 Baird G, Charman T, Baron-Cohen S, Cox A, Swettenham J, Wheelwright S, Drew A. A screening instrument for autism at 18 months of age: A 6-year follow-up study. Journal of the American Academy of Child and Adolescent Psychiatry, 2000; 39: 694-702. 9 Robbins DI, Fein D, Barton MI, Green JA. The modified checklist for autism in toddlers: an initial study investigating the early detection of autism and pervasive developmental disorders. Journal of Autism and Developmental Disorders, 2001; 31(2): 149-151. 10 Stone WL, Coonrod EE, Ousley OY. Brief report: screening tool for autism in two-year-olds (STAT): development and preliminary data. Journal of Autism and Developmental Disorders, 2000; 30(6): 607-612. 11 Berument SK, Rutter M, Lord C, Pickles A, Bailey A. Autism Screening Questionnaire: diagnostic validity. British Journal of Psychiatry, 1999; 175: 444-451. 12 Ehlers S, Gillberg C, Wing L. A screening questionnaire for Asperger syndrome and other high-functioning autism spectrum disorders in school age children. Journal of Autism and Developmental Disorders, 1999; 29(2): 129-141. 13 Garnett MS, Attwood AJ. The Australian scale for Asperger's syndrome. In: Attwood, Tony. Asperger's Syndrome: A Guide for Parents and Professionals. London: Jessica Kingsley Publishers, 1997. 14 Scott FJ, Baron-Cohen S, Bolton P, Brayne C. The Cast (Childhood Asperger Syndrome Test): preliminary development of a UK screen for mainstream primary-school-age children. Autism, 2002; 2(1): 9-31. 15 Tadevosyan-Leyfer O, Dowd M, Mankoski R, Winklosky B, Putnam S, McGrath L, Tager-Flusberg H, Folstein SE. A principal components analysis of the autism diagnostic interview-revised. Journal of the American Academy of Child and Adolescent Psychiatry, 2003; 42(7): 864-872. 16 Lord C, Risi S, Lambrecht L, Cook EH, Leventhal BL, DiLavore PC, Pickles A, Rutter M. The autism diagnostic observation schedule-generic: a standard measure of social and communication deficits associated with the spectrum of autism. Journal of Autism and Developmental Disorders, 2000; 30(3): 205-230. 17 Van Bourgondien ME, Marcus LM, Schopler E. Comparison of DSM-III-R and childhood autism rating scale diagnoses of autism. Journal of Autism and Developmental Disorders, 1992; 22(4): 493-506. 18 Department of Health and Human Services. Mental Health: A Report of the Surgeon General. Rockville, MD: Department of Health and Human Services, Substance Abuse and Mental Health Services Administration, Center for Mental Health Services, National Institute of Mental Health, 1999. 19 Lovaas OI. Behavioral treatment and normal educational and intellectual functioning in young autistic children. Journal of Consulting and Clinical Psychology, 1987; 55: 3-9. 20 McEachin JJ, Smith T, Lovaas OI. Long-term outcome for children with autism who received early intensive behavioral treatment. American Journal on Mental Retardation, 1993; 97: 359-372. 21 Couper JJ, Sampson AJ. Children with autism deserve evidence-based intervention. Medical Journal of Australia, 2003; 178: 424-425. 22 American Academy of Pediatrics Committee on Children With Disabilities. The pediatrician's role in the diagnosis and management of autistic spectrum disorder in children. Pediatrics, 2001; 107(5): 1221-1226. 23 Dunlap G, Foxe L. Teaching students with autism. ERIC EC Digest #E582, 1999 October. 24 Autism Society of America. Biomedical and Dietary Treatments (Fact Sheet) [cited 2004], 2003. Bethesda, MD: Autism Society of America. Available from: www.autism-society.org/site/PageServer. 25 McDougle CJ, Stigler KA, Posey DJ. Treatment of aggression in children and adolescents with autism and conduct disorder. Journal of Clinical Psychiatry, 2003; 64 (supplement 4): 16-25. 26 Research Units on Pediatric Psychopharmacology Network. Risperidone in children with autism and serious behavioral problems. New England Journal of Medicine, 2002; 347(5): 314-321. 27 Hviid A, Stellfeld M, Wohlfahrt J, Melbye M. Association between thimerosal-containing vaccine and autism. JAMA, 2003; 290(13): 1763-1766. 28 Akshoomoff N, Pierce K, Courchesne E. The neurobiological basis of autism from a developmental perspective. Development and Psychopathology, 2002; 14: 613-634. 29 Korvatska E, Van de Water J, Anders TF, Gershwin ME. Genetic and immunologic considerations in autism. Neurobiology of Disease, 2002; 9: 107-125.